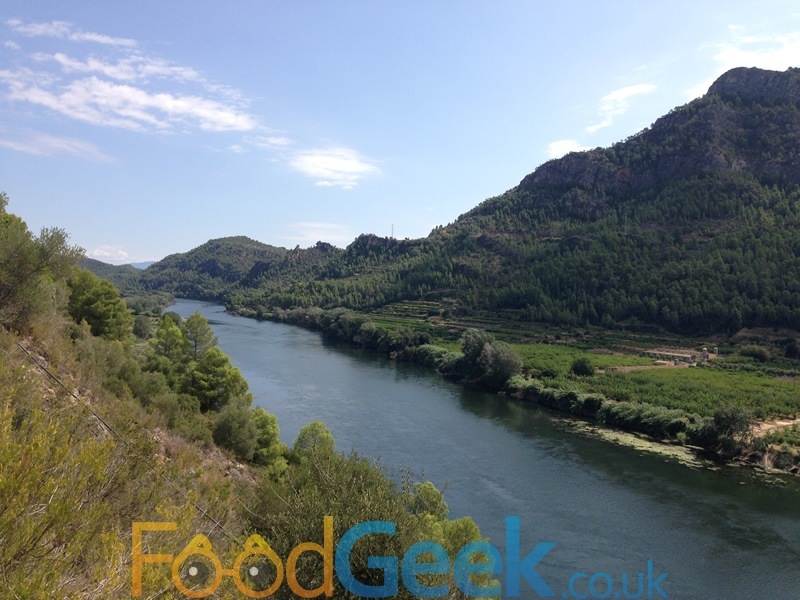 Staying in a remote riverside lodge by the Ebro River in the Tarragona mountains we were surrounded by stunning views but few options when it came to eating out. The nearest village ‘Benifallet’ was a 10 minute drive and contained just 3 or 4 restaurants with a few bars and a hotel also serving food. We chose ‘Braseria Rosa Mari’, a tiny place with just a handful of tables but bags of charm. Like ‘Esquitx Creperia‘ the staff didn’t speak any English but my Spanish was already improving and thankfully some of the menu had been translated. We started with bread & aioli and olives before moving onto starters of ‘Pa amb tomàquet’ or ‘Tomato Bread’, a classic Catalan dish served in pretty much every restaurant in the area and toast with peppers and anchovies. All were everything good about traditional Spanish food; simple ingredients prepared well that all work beautifully together. Main courses consisted of a variety of meat and seafood dishes, mostly cooked over a charcoal grill. 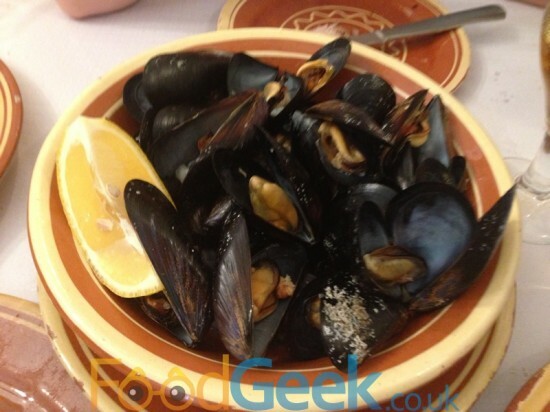 We went for ‘Mussels’ which were well cooked but the accompanying broth a little dull and wishy washy. They weren’t kidding when they described the squid in the next dish; ‘Baby Squid With Broad Beans’. 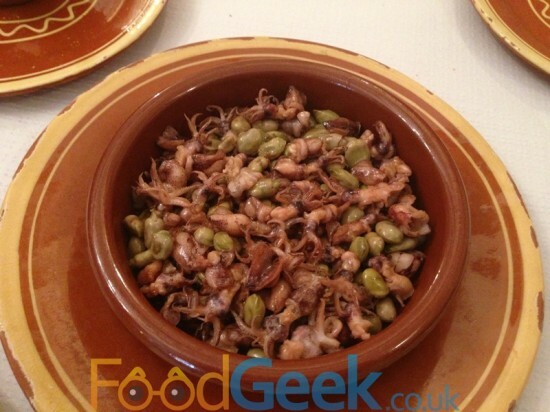 Whole, individual, tiny little squids cooked simply with broad beans. It was my first time eating baby squid like this but hopefully not the last as they tasted lovely. Although I did feel a little bad as they looked so cute! When I ordered the ‘Rabbit’ dish the waiter pointed first to his rib cage and then to his thigh. Being a champion Charades player in my youth I knew he was asking me which cut of rabbit i’d like. I went for the latter. 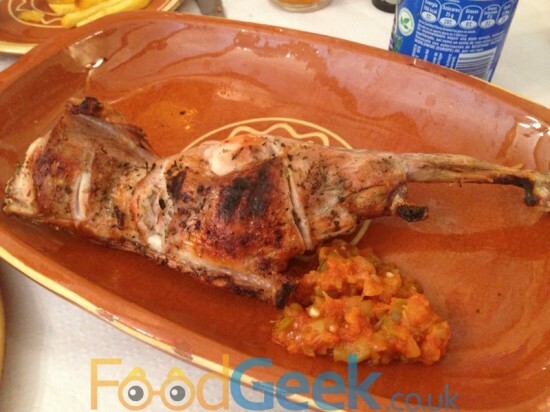 I was right, we received a whole leg of rabbit which had been cooked over charcoal. It tasted great but was perhaps a little overcooked as it had started to dry out. The best dish was ‘Octopus, Paprika & Olive Oil’. A stunning combination of perfectly cooked, soft slices of octopus sprinkled with paprika and drizzled with olive oil. 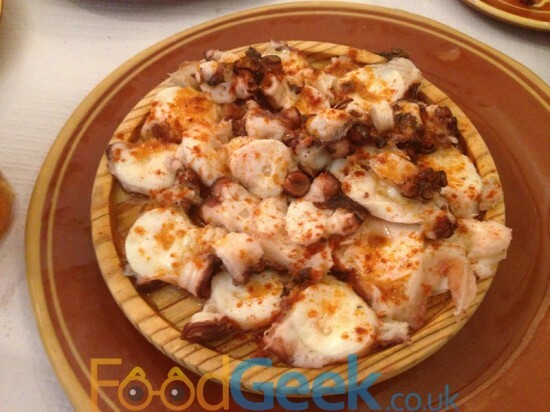 For me it represented everything great about Spanish cuisine on a plate. 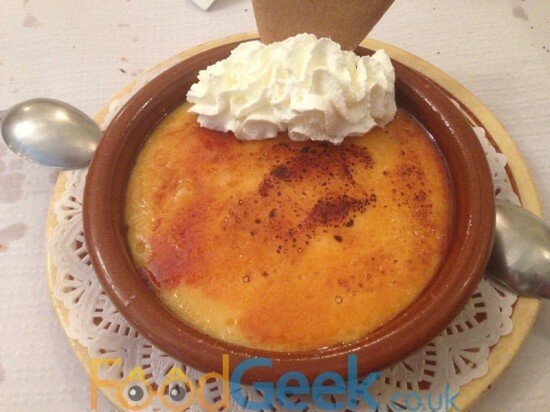 I can’t resist ordering Crème Brulée anytime I see it on a menu and the same goes for ‘Crema Catalana’ since they’re essentially the same dish. I’d have liked a little more caramelisation of the sugar but the custard base was excellent. Wonderfully rich and the perfect thick, creamy but smooth consistency with a hint of cinnamon and citrus. The first of many I hoped but the standard had been set pretty high. 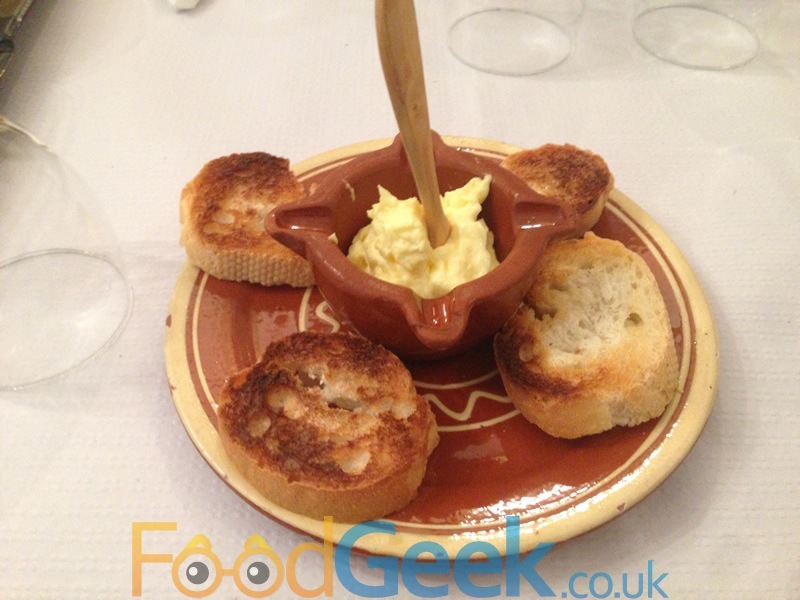 I really enjoyed Braseria Rosa Mari it was a perfect introduction to Spanish village life. It’s not inventive or glamourous or trying to be anything other than a great little village restaurant. The food is simple but fresh and tasty, an excellent representation of Spanish and particularly Catalan cuisine. I’ll definitely return if I’m ever staying near Benifallet again. 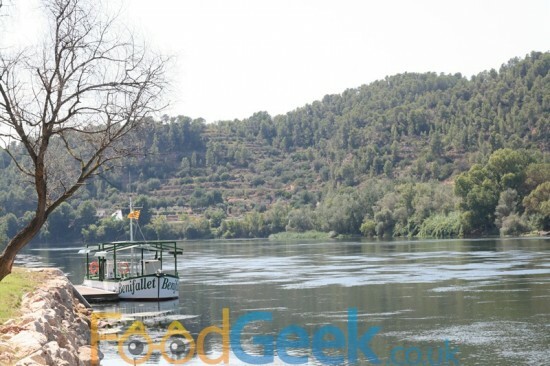 Next: Sakura Japanese Restaurant, Salou, Spain – ‘All You Can Eat’ Sushi!